An embedded payment flow enables users to pay without appearing to leave your site or app. An embedded payment flow can be used for simple, parallel, and chained payments. For more information, see the "Embedded Payments" section of Introducing Adaptive Payments. The lightbox option provides the embedded payment flow as an overlay. The mini-browser option provides the embedded payment flow in a mini-browser window. Lightbox functionality requires the following steps. For information about digital goods payments, see the "Payments for Digital Goods" section in the Pay API reference documentation. Create a new HTML file and paste the following code into the file. 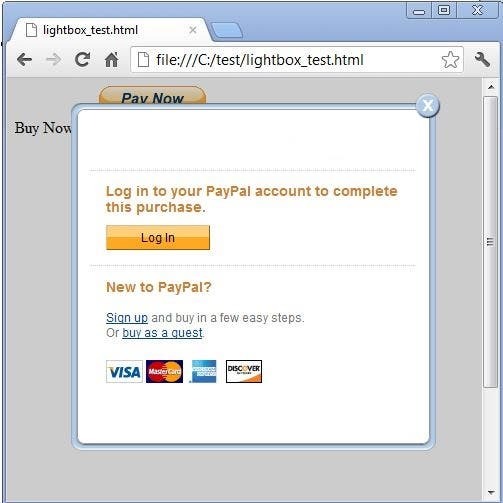 The expType variable is set to light, so a test user will use a lightbox to complete authorization in the PayPal sandbox at https://www.sandbox.paypal.com/webapps/adaptivepayment/flow/pay. For the payKey input value, replace insert_pay_key with a payKey value that you recently obtained using a Pay call, and save the HTML file. Please see Go Live with Your App regarding the review process for applications that include adaptive payments or other advanced functionality. Mini-browser functionality requires the following steps. For information about digital goods payments, see the "Payments for Digital Goods" section in the Pay API reference documentation. The expType variable is set to mini, so a test user will use a mini-browser to complete authorization in the PayPal sandbox at https://www.sandbox.paypal.com/webapps/adaptivepayment/flow/pay. For information about the review process for applications that include adaptive payments or other advanced functionality, see Go Live with Your App.